Marco Stanley Fogg is an orphan, a child of the sixties, a quester tirelessly seeking the key to his past, the answers to the ultimate riddle of his fate. As Marco journeys from the canyons of Manhattan to the deserts of Utah, he encounters a gallery of characters and a series of events as rich and surprising as any in modern fiction. Beginning during the summer that men first walked on the moon, and moving backward and forward in time to span three generations, Moon Palace is propelled by coincidence and memory, and illuminated by marvelous flights of lyricism and wit. Here is the most entertaining and moving novel yet from an author well known for his breathtaking imagination. Paul Auster is four for four with me. This is the fourth novel of his I've read and once again he delivered. This is a book that offers unlikely adventure, a bit of mystery, and a whole lot of heartache. As always, the characterization of Auster's main character is incredibly believable, but also unconventional. The plethora of characters and events Fogg is met with are whimsical and odd, but also complex and exuberant, making for a fun and intelligent read. As the title implies, the moon is a reoccurring symbol throughout the novel. Fogg's story begins with the summer that man first walked on the moon. In his Columbia apartment he can see the Chinese restaurant Moon Palace from his window. (A restaurant that did exist when Auster when attending Columbia.) Marco's Uncle Victor plays in a band called Moon Men and Moonlight Moods. The moon surfaces on a fortune cookie Marco opens that reads "the sun is the past, the earth is the present, the moon is the future." There are endless passages that discuss the moon and it all highlights the idea of constant change, but also constant repetition, the notion of unattainability and absence and an endless searching, for oneself, for meaning, and for a place. It also signifies the passing of time and the continual evolution and development of the self; the person we will be tomorrow may be much different from the one we know today. I immediately thought of Uncle Victor and his band, and in that first, irrational moment, my fears lost their hold on me. I had never experienced anything so sudden and absolute. A bare and grubby room had been transformed into a site of inwardness, an intersection point of strange omens and mysterious, arbitrary events. I went on staring at the Moon Palace sign, and little by little I understood that I had come to the right place, that this small apartment was indeed where I was meant to live. Moon Palace also explores the meaning and implication of "fatherlessness" and the pressures of fatherhood itself. As with most Auster novels, he also examines identity and loss. I think the key to reading Auster is to not read them all at once. I like to keep a steady pace while working my way though his oeuvre. Because his novels are similar in terms of tone, character, and themes, it's best to put some time between his works. Other than that, I really don't have any complaints. This was a great read and Auster is working his way up to become one of my all-time favorite writers. *This is the first edition Penguin In I've owned and I have to say they are lovely; rough-cut pages, beautiful cover art, and images from the story are incorperated on the inner flaps of the book. One image of a broken umbrella is from my favorite scene of the novel and really, it doesn't get much better than that. Yes I really liked it! But The Brooklyn Follies is still my favorite Auster to date. What's yours? invisible was a really great read... left me not knowing what i read, and not sure if i wanted to figure it out, but definitely unable to stop thinking about it. sunset park was just alright according to me. for some strange reason, with modern authors (as with music) i tend not to want to go into their back-catalog unless i'm entirely drawn in by more recent works. after invisible, i would have eagerly jumped into moon palace, but after sunset park, not so much. maybe i should give it a shot! I haven't yet read Invisible. I'll be sure to add that to my tbr. I'm also disappointed to hear you didn't enjoy Sunset Park. I haven't read that one yet either, but I am so drawn to the cover art. I've never read Austere but this sounds like a good one. The cover art is really cool. Do you know the other titles in this Ink series? I guess I could always google it! Yeah if you google "Penguin Ink collection" it shows some of their other covers. They all look pretty cool! I think if you gave Auster a try you would like him. 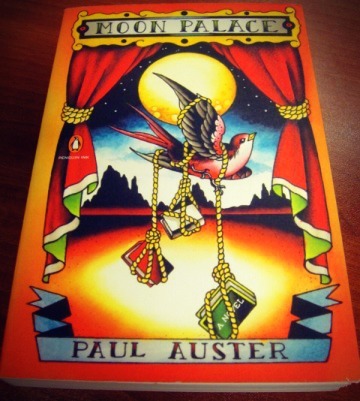 I loved MOON PALACE too and I'm happy you saw the beauty in it...but you'll soon start to run thin in Auster's quality stuff. He wrote some goddamn awful stuff in the last five years. Nooo don't tell me that! I was thinking next I'd try Oracle Night or Timbuktu. I just read Oracle Night (my first Auster) and I enjoyed it. Of course I can't compare it to his other works. I'm excited to read more of his novels. I heard good things about Timbuktu, but it's about a dog, so I don't want to read it or I'm going to cry. I love Auster but I haven't gotten around to reading this one just yet. I think I own it, though, so whenever the mood strikes, I'm ready! Sorry to be anonymous - just wanted to weigh in quickly. I really loved Moon Palace. It had a quality of another favorite of mine, Wallace Stegner's Angle of Repose, which I really enjoyed and was happily surprised by. I have also kind of been bit by the Auster bug and am into my fifth novel of his. I suppose I will stop before reading all the works at once, but so far I have enjoyed every word I've read. My independent study of his work is admittedly incomplete, but I find running themes in Auster's work to be indentity and serendipity and I think Moon Palace is a successful meditation on both.